CelebriGum: Guess The Mystery Celebrity! 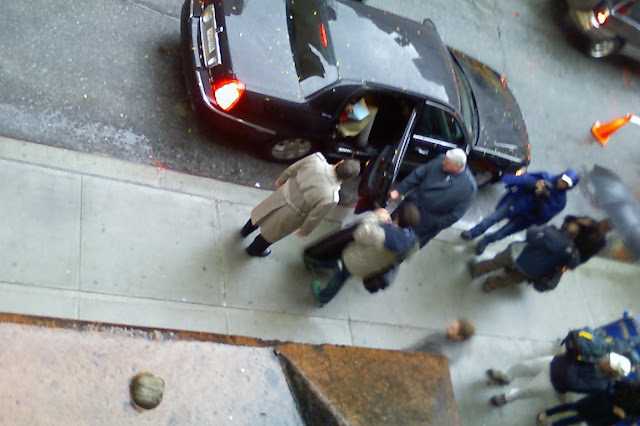 Can you identify the celebrity in the limo? Look carefully at that glamorous hand and leg! Hint: it's someone who appeared on the Late Show this fall. Enter your guess in the comment area below, e-mail me via the button on the right, or visit the CelebriGum Facebook page. Deadline: Friday November 26th, 5 p.m. Eastern time. Employees of CelebriGum and their immediate families not eligible. Winner responsible for all taxes. There's no prize; I'm just saying that in general, people have to be responsible for paying their taxes. UPDATE: The Mystery Celebrity is Steve Martin. Now that you know, doesn't it seem obvious? I take it back. It's the Trumpster. Hmmmm... Now that I think about it, I've never seen Steve Martin and Red Skelton together at the same time.